Jessica and Justin met over swing dance lessons in college. 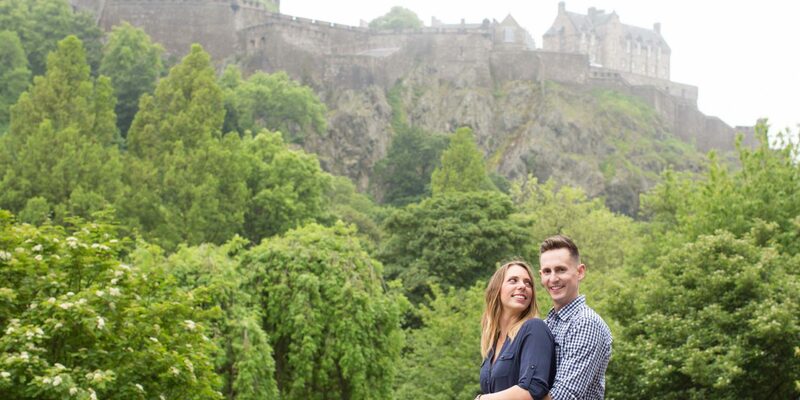 After a slightly awkward start and thirteen years, he planned a super special Edinburgh proposal. Read on for how it went down. “Justin is terrible at being sneaky, so I knew about the proposal. He’d left a ring sizing chart on the printer at home and I found it one day when I went to print something. I pretended I hadn’t seen it, but it sat there for weeks afterward! I had a pretty good guess he would propose during our photoshoot, but a glimpse of an email with our Flytographer on his iPad confirmed it! While I would have loved to have been surprised, I don’t mind that I knew in advance. It’s something that Justin would totally do – so it makes the story unique to us! Plus, it meant that I had a month of build up to the actual day, moments where I could think about it and smile.